Produces less smoke and odor. Uniform and slow burning, these rigid, compressed sticks (made by a special charcoal process) are 4.3″ x 0.6″ dia and contain a proprietary combination of moxa and herbs (Folium Artemisiae Argyi, Radix Angelicae Dahuricae, Rhizoma Et Radix Notopterygii, and Radix Et Rhizoma Nardostachyos). A lighter (or candle) is necessary to ignite. 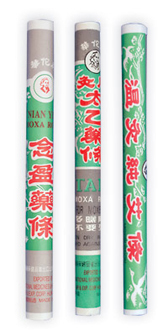 Chinese traditional packed moxa rolls are used for indirect moxa heat treatment. Pure Rolls contain only moxa. 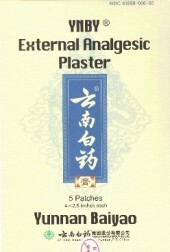 Tai-I and Nien-Ying contain additional natural herbs. Tai-I is made up of Rhizoma Et Radiz Notopterygii, Radix Aucklandiae, Radix Angelicae Dahuricae and Radix Salviae Miltiorrhizae. Nien-Ying contains Rhizoma Alpineiae Officinarum, Ramulus Cinnamomi, Radix Angelicae Pubescentis and Radix Angelicae Dahuricae. Paper covered rolls measure approximately 8.3″ x 0.75″ dia. Pure rolls are the most popular. Needle moxa (from China) for warming needles. Moxa is compressed and paper wrapped into 0.6″ x 0.45″ dia cylinders. These moxa cylinders may be inserted onto the handle of a metal handle needle or moxa cap. New Mini-200 are mounted on 10 easy-to-use wooden skewers. New smokeless moxa rolls with 0.15″ dia hollow center makes these easier to light and burn with less smoke and odor. These rigid, compressed rolls (made by a special charcoal process) are 4.4″ x 0.6″ dia and contain a proprietary combination of moxa and herbs. A lighter or a candle is recommended for igniting. Press pellets for ear (and body) points. Similar to the Magrain pellets except the 1.2 mm dia stimulating press ball is made from 24k gold plated stainless steel or silver. Supplied on 0.3″ dia clear (transparent) hypoallergenic tape. 300 pellets per pack. Sakamura Magrain for ear (and body) points. Available in either silver or 24k gold plated 1.2 mm ion pellets. Magrain Ion Pellets also offer Polarity Agent effects. Supplied on 0.3″ dia clear (transparent) or tan color tape. 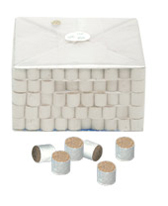 Pkg of 300 pellets. Features a 0.1″ wide slot for removing hot moxa Needle Caps from needle handle. May also be used to remove other needle moxa. 3″ x 0.8″ x 0.8″. Safe and practical, this 7″ long half-split spoon is perfect for removing hot moxa caps from needles. Why risk burning yourself or your patient, when you can use this protective accessory. Spoon measures 1.5″ at its base with a 2 mm wide slot, and is made of stainless steel. 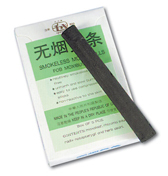 A must for any needle moxibustion treatment. Menthol/camphor based analgesic rubbing alcohol. Notoginseng/eucommia analgesic in a gentle rice-wine base. 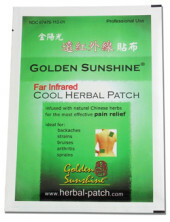 Herbal pain relieving patch (topical). For the temporary relief of minor aches and pains of muscles and joints due to simple backache, arthritis, strains, bruises, and sprains (topical). TDP Therapeutic Lamp features a plate coated with a proprietary mineal formation consisting of 33 elements. TDP lamps has successfully treated up to 60 million patients in China. When heated by as electric heating element, this mineral plate emits a special band of electromagnetic waves in the infrared range of 2 to 25 microns in wavelength and 28 to 34 mv/sq.cm in intensity. In clinical applications in China and other Eastern Countries for over 15 years, the TDPlamp has proven itself to be effective in treating ailments such as chronic wounds, joint pain, arthritis, back pain, injuries and some skin conditions like herpes and psoriasis etc. 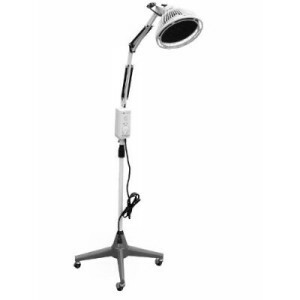 TDP lamp has been widely used for more than 100 ailments.